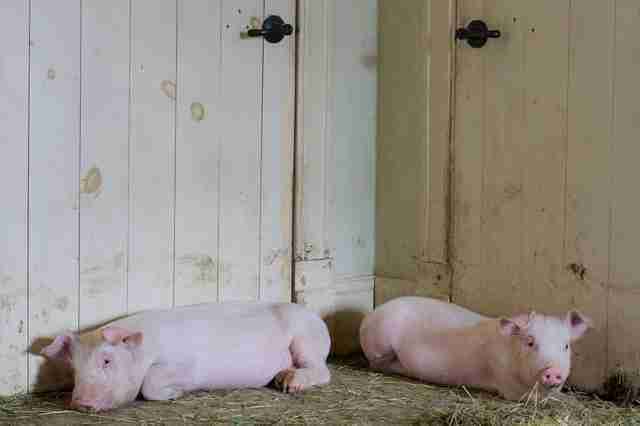 On a factory farm, behind thick metal bars, a pig without a name lost her babies over the summer. Again. She knew them for just 17 days. But there wasn't much knowing to be had. The bars kept her from turning her head - although she tried. And then - before the nameless pig could begin weaning her piglets - they all disappeared. The farmer's idea was to encourage the mother to give birth all over again, as quickly as possible. 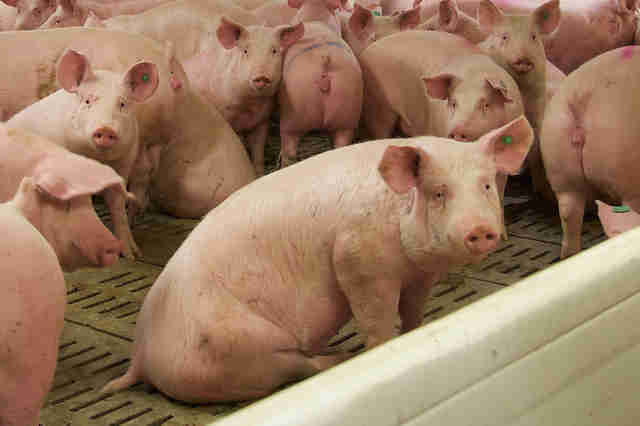 Most of them would be driven to a slaughterhouse when they were just 6 months old. 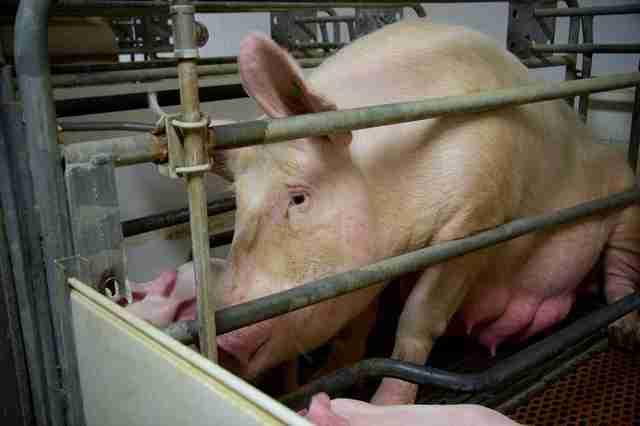 So the cycle of birth and loss on this factory farm, it seemed, would grind on and on until this nameless pig had nothing more to give. But every now and then, a mother's dream escapes the dim confines of a factory farm. And sparks a little hope. A group of animal rescuers from Direct Action Everywhere visited the farm earlier this month. "Witnessing the stress these mothers have when they're in labor and can't show love for their babies was one of the most terrifying things I've ever seen," Jenny McQueen, a member of Direct Action Everywhere, tells The Dodo. They managed to take one quivering piglet out of there. And that baby not only got a name. But also a home, where she would spend the rest of her days. 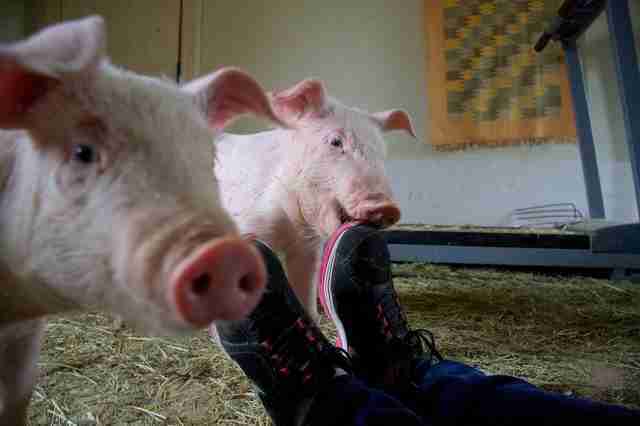 Madison got to move to a sanctuary, where she's already embracing her new life. "She is very inquisitive, enjoys belly rubs, is extremely clean, and enjoys feasting on bananas and other fruit with other animal friends," McQueen says. Like goats, sheep, other pigs and chickens. And, of course, some very compassionate humans. Madison is just one little pig. Many more suffer every day. But sometimes, all it takes is just one to show us there's a better way to live with animals. "True that this is 'just one pig,'" Alex Bezjak, another member of Direct Action Everywhere, tells The Dodo. "But to Madison, her life is just as valuable as yours is to you." The group has started a petition, demanding that major retailers cut ties with farms that mistreat animals. You can sign it here. You can also watch a video of Madison's rescue here.